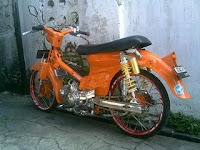 This is a Honda C70 Drag Bike Modification. Honda C70 motorcycle that should his parents and this lady has changed in such a way. Until now the original form is not visible. With a lighter overall weight, and the addition of a high-power runway, making Honda C70 has above average speed, 6.42 / 201m.